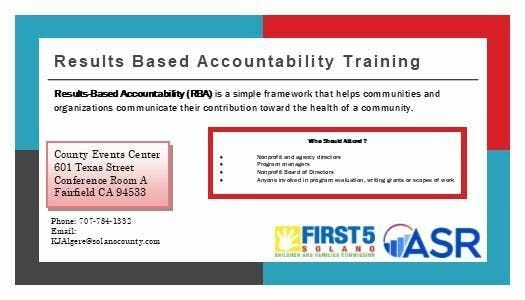 Results-Based Accountability (RBA) is a simple framework that helps communities and organizations communicate their contribution toward the health of a community. This workshop, open to participants who work with children and families in Solano, will be facilitated by Applied Survey Research a leading bay area social services evaluation firm. The workshop will help participants learn to use their data to tell their story and develop goals. No prior experience with RBA is necessary.